On December 3rd, 27 students gathered at WholeRen’s Pittsburgh office to attend the first artificial intelligence (AI) workshop held in collaboration with Carnegie Mellon University Professor David Touretzky. On December 3rd, 27 students gathered at WholeRen’s Pittsburgh office to attend the first artificial intelligence (AI) workshop held in collaboration with Carnegie Mellon University Professor David Touretzky. The workshop program began in a live session on Dec. 3 and will run online through Dec. 23rd. The goal of the workshop was to provide young students the opportunity to explore the field of AI and take a look at the world from a different perspective. 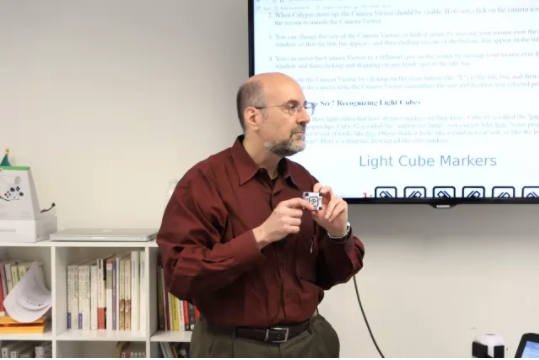 In this workshop, students will learn the basics of Calypso – the programming software for the AI robot “Cozmo.” With the tools and techniques to program Cozmo, students will be able to apply their own creative designs to the robot while also thinking critically about AI and its role in our lives. 27 students from 5 different states came to Pittsburgh to attend the training on Dec. 3rd, while 6 students joined the online live session. The training session on Sunday was led by Dr. Touretzky and his colleagues, Ada and Natalie from CMU’s TechNights program. Dr. Touretzky is a research professor in the Computer Science Department and the Center for the Neural Basis of Cognition at Carnegie Mellon University. Dr. Touretzky worked hard to create a welcoming atmosphere, encouraging even the youngest students to actively engage and ask questions. Through controlling the Cozmo Robots, students were able to grasp a basic understanding of Calypso very well, despite its abstract nature. Based on the success of this event, we plan to hold more tech-related events to encourage the young to step out of their comfort zone, try new things, be more creative, and conquer their fears of new experiences. “Every student deserves more possibilities and that is why we are here,” said WholeRen CEO, Andrew Chen.